You are here: Home>Bottesford Parish 1st World War Centenary Project>1st World War Service Biographies>Survivor biographies>Capt. Harold Barker R.F.C. 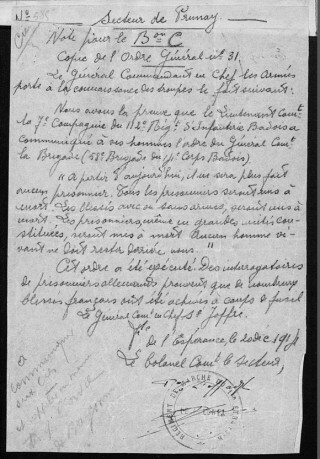 General Joffre's order, 20th December, 1914 for the killing of all German prisoners and wounded in reprisal for the shooting of French prisoners by the Germans. The precision of Joffre's order is chilling: "From now, there will be no more prisoners. All prisoners shall be put to death. The wounded under arms are to be put to death. Prisoners, even in large units will be put to death. No living man must remain behind us"
Pilot Certificate record card for 2nd Lieut. 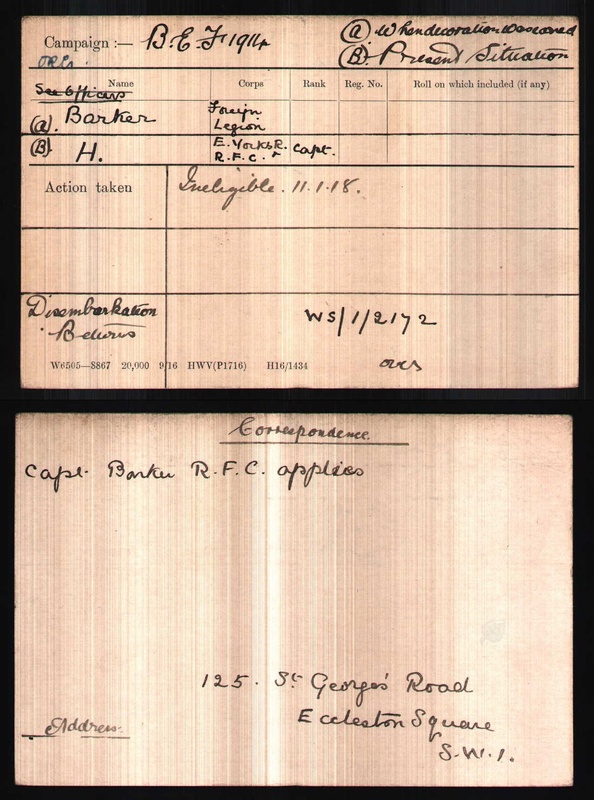 Harold Barker, 9th Battalion, East Yorkshire Regiment. Two short articles appeared in the Grantham Journal in June 1916 and February 1917. 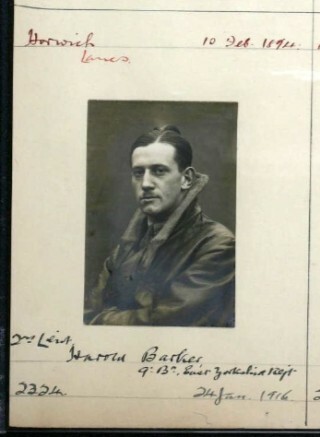 They describe the early WW1 flying career of Harold Barker. An exotic and adventurous character is presented. 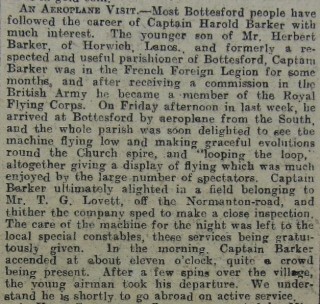 Of notable expertise and with sufficient military seniority to command a plane for his own use in presenting an aerial display to the residents of Bottesford and district in early 1917. We learn that he was the younger son of Mr. Herbert Barker of Horwich, Lancs. : a former ‘respected and useful parishioner of Bottesford’. It has not been possible to work out when exactly and why the Barker family moved to Bottesford. In the 1901 Census for Bottesford a John Barker (aged 60) and Sarah Barker (aged 79) are listed as living on ‘The Green’. Sarah was a Harper before marriage and John was born in Holbeck. (Please click on the the following link to see further details of John and Sarah Barkers living on The Green). It seems very likely that there was a family connection with Herbert Barker. The exact nature of this connection has yet to be established. An ‘H. Barker’ is also listed as a private resident living on ‘The Green’ in the 1908 Kelley’s Directory. The Bottesford School logbook for the 20th September 1906 also records that Mr. Herbert Barker checked the school register with the Rev. Vincent-Jackson. 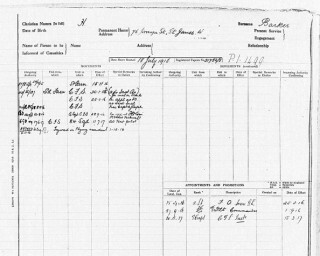 However, all the census returns up to and including that of 1911 give the Barker family as residing in Horwich, Lancs., except for Harold who by 1911 was a boarder in the Bottesford area at the nearby Sedgebrook Grammar School. 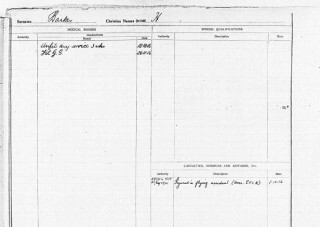 The 1911 Census return records that Harold’s elder brother, Herbert, was born in Bottesford. 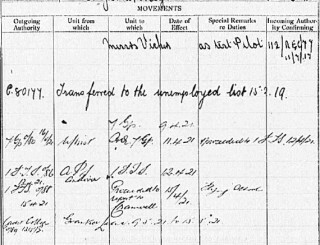 This is at odds with earlier Census returns for 1901 and 1891 that list his brother’s birth place as Horwich. Was Herbert born in Bottesford and then registered in the family’s home town of Horwich? Harold’s and Herbert’s mother’s maiden name was Rosetta Kellam. Whilst no Kellams are listed as resident in Bottesford, Kellams are listed as living in the nearby village of Redmile. Perhaps that was the connection with the locality. 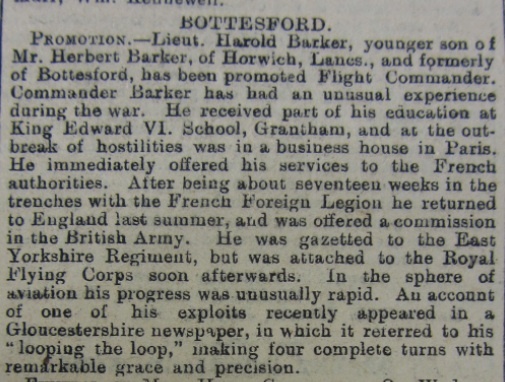 No matter what the exact circumstances of the Barker family connections with Bottesford they were of sufficient note for Harold’s stellar career with the newly formed Royal Flying Corp to attract the attention of the local press. Born on the 10th October 1894, by the outbreak of WW1, at the age of twenty, he was in Paris pursuing business interests. He then enlisted with the French Foreign Legion, as did several hundred other British residents in Paris. They would experience fierce fighting on the Marne from October onwards. Just exactly what training they would have received is open to question. What is known is that no quarter was given by either side in that sector of the war. 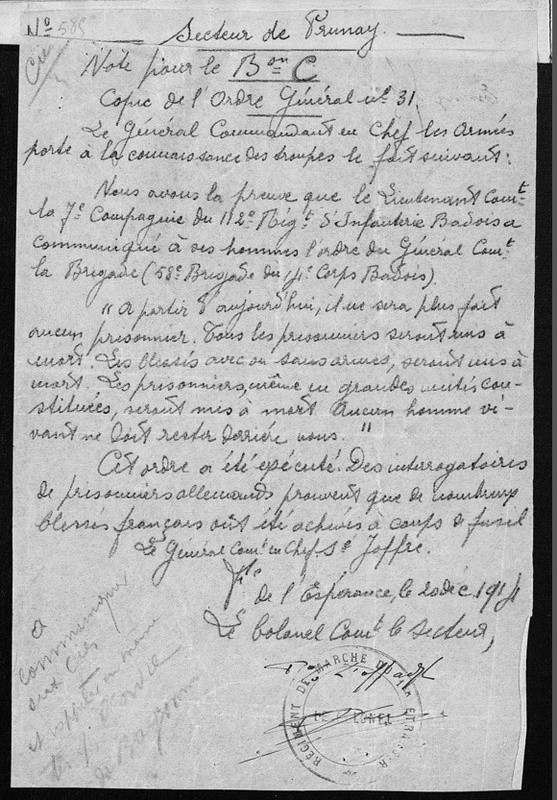 Orders for the execution of all German prisoners of war and wounded was given on by the French Commanding Officer in reprisal for the reported atrocities perpetrated by the Germans on French prisoners. 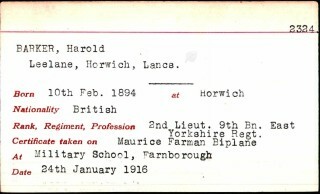 Harold is reported as having served 17 weeks at the front. He was lucky to survive that long given the losses suffered by French Foreign Legion. It is interesting that he was able to return to England. The terms of engagement in the French Foreign Legion were for the total duration of the war. How exactly he was able to terminate his service is unknown. 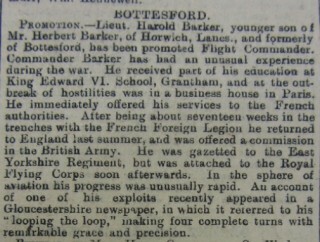 The Grantham Journal articles note Harold Barker was rapidly promoted. 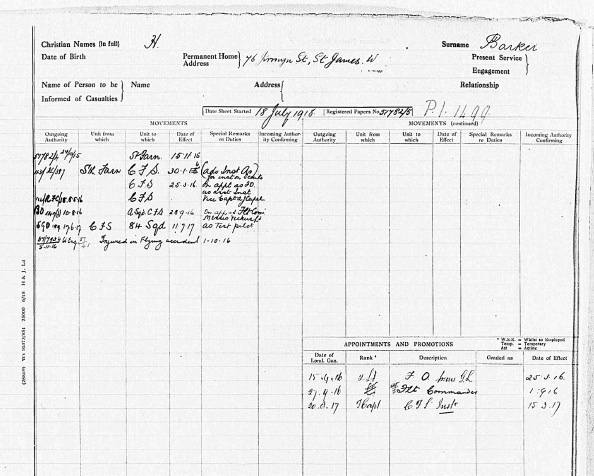 His service records provides details of that rapid climb through the ranks. Of particular note by the local press was his flying expertise. This is also reported as having commanded attention in the press in Gloucestershire! He is able to loop the loop with “grace and precision”. 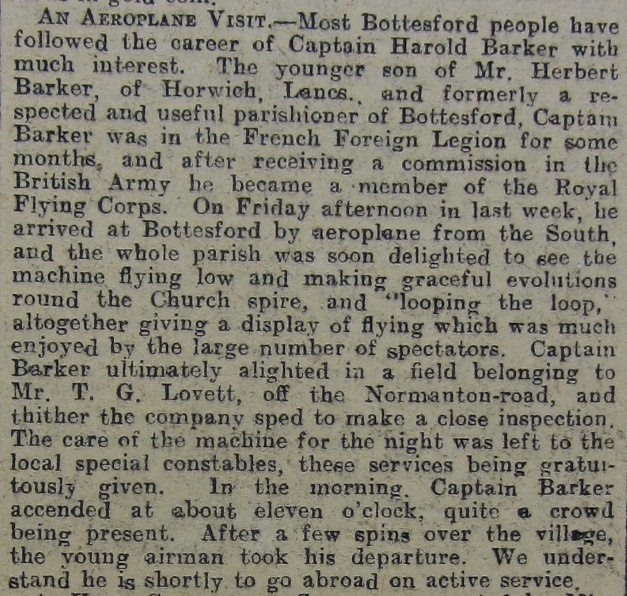 On Friday 16th February, 1917 Captain Harold Barker flew back into Bottesford “giving a display of flying that was enjoyed by a large number of spectators”. He lands his plane in a nearby field. The local constabulary volunteer to guard it overnight. After a night in Bottesford before “quite a crowd” he flies off the next morning at eleven o’clock. Spinning over the village “the young airman took his departure” for what is assumed would be active service abroad. His service records tell a somewhat different if equally accomplished story. They also reveal how an individual could command the use of a military aircraft for what appeared to be his personal use and civilian entertainment. 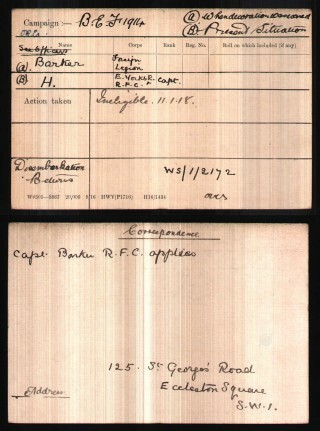 Harold Barker’s service records reveal further details of his rapid rise in the RFC. His skills were such that he would not be sent to serve on the front. His war was to be spent instructing others and testing aircraft. The Royal Aero Club recorded the successful award of pilot certificates for all those trained in the UK. Each fully trained pilot’s qualification, rank and service unit was recorded with their photograph. 2nd Lieut. Harold Barker’s portrays a confident looking young man of twenty two. 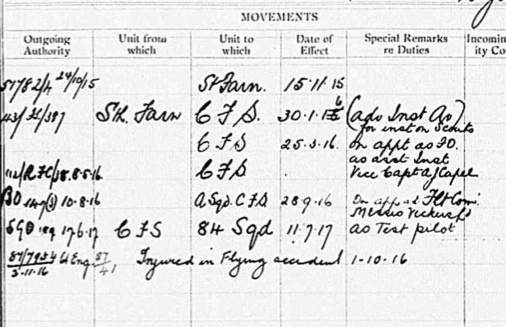 He had transferred to the Central Flying School at Farnborough on the 15th November 1915. His flying certificate was issued less that two months later on the 24th January 1916. The card entry also records that he achieved his certification flying a Maurice Farman Biplane similar to the one shown in the photograph below. His flying career would see him quickly move onto more advanced aircraft. On the 30th January, just one week after qualifying, he was put on an ‘Advanced Assistant Instructor’ course for Bristol Scouts. These planes were withdrawn from front line service and reserved for instruction in June 1916. They were also allocated as ‘run abouts’ for senior officers. 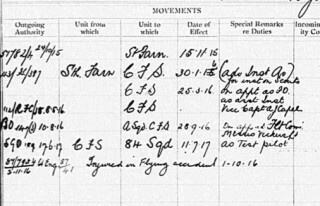 This explains his access to an aircraft for use over the skies of Bottesford in February 1917. By then he was a senior officer. We can see that in 1916 he continues his rapid promotion through the ranks as an instructor at the Central Flying School (CFS), Farnborough. On the 25th March he is appointed a Flying Officer as an Assistant Instructor. By the 1st September he is promoted Flight Commander with CFS, A Squadron, followed at the end of that month on the 28th with his transfer to 84 Squadron and appointment as a Test Pilot with ‘Messrs. Vickers’. This was not without risk. Three days later on the 1st October he is injured in a flying accident. This accident takes him out of service for nearly two months until the 28th November. This suggests his injuries must have been quite considerable. 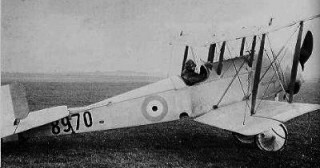 However, by the following March in 1917 he is promoted to Temporary Captain as an Instructor with the Central Flying School. 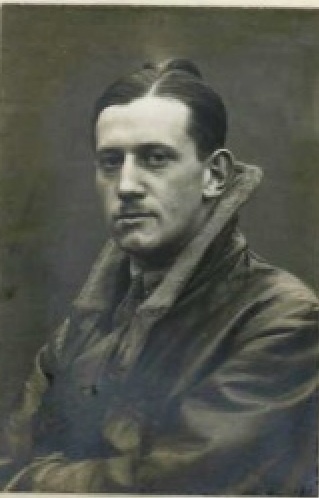 During the period in which Harold Barker trained with the RFC many of the instructors were themselves newly qualified. Neither had many experienced front line action flying aircraft. Their inexperience was noted both by trainee pilots and by those in charge of the newly qualified pilots at the front. Overall as Robert Morley describes in his detailed work on British Pilot Training, 1912-1918, there was an atmosphere of haste in the whole training programme. So much so that there was even evidence of instructors falsifying the records of trainee pilots. This was apparently done in order to sustain the quantity and speed of graduating pilots at the expense of the quality of their capabilities. What effect such a cavalier approach to training standards and to the probity of record keeping might have had on Harold Barker can only be guessed at. Whatever the impact of the culture of practice in the RFC at that time, Harold Barker’s aptitude for flying must have stood out for him to become a test pilot. Service as a Vickers’ test pilot would certainly have taken him to their factory at Brooklands, Weybridge some twenty miles east of Farnborough. That is where Vickers tested new aircraft. 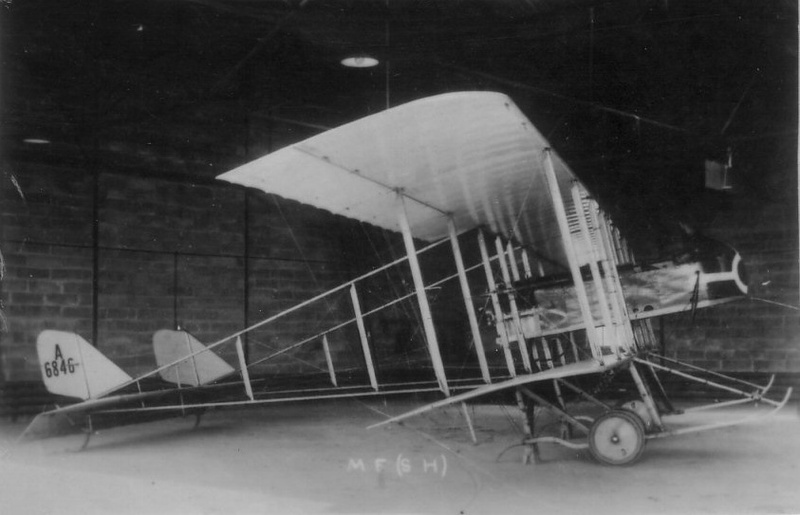 Their aircraft underwent rapid technological development during the period of Barker’s secondment. His work must have been of merit for him to be promoted to a permanent rank Captain on the 1st April 1918. 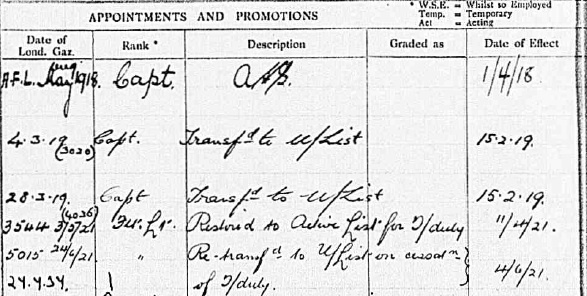 He continues in the same role until he is demobilized and transferred to the ‘unemployed list’ in February 1919 whilst retaining the rank of Captain. Harold must have been keen to maintain his association with flying. In 1921 he is restored to the Active Service List for Flight Duty as a Flight Lieutenant on the 11th April. He proceeded to report at the Cranwell Flying School in Lincolnshire on the 15th April and is granted a weeks leave from the 9-15th May. This training did not lead to any permanent form of RAF service. 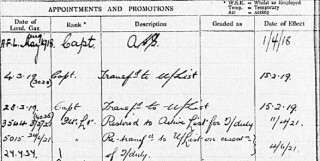 In early June 1921 he is ‘re-transferred to the unemployed list of cessation of flight duty’. His records also provide a window onto his post war life. Throughout the war and in his immediate post war association with the newly formed RAF he gives two addresses in the St James’s area of central London. These are prestigious locations and reveal either substantial means or a capacity to command a credit in line with maintaining a London life style. Harold Barker had certainly travelled some distance, both geographically and socially, from his origins in a northern suburb of Manchester as a draper’s son. 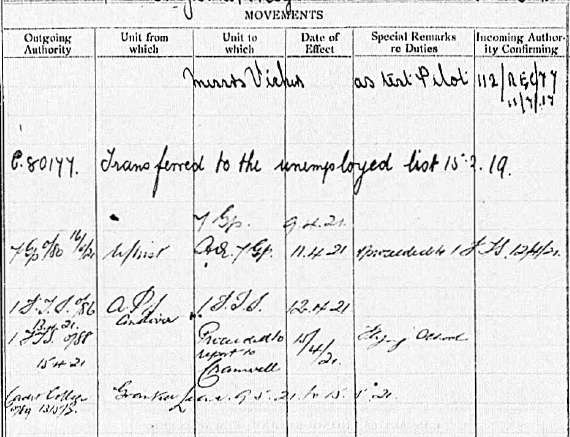 No trace of his origins in Horwich show in his records. In addition, there is no detailed address for his father, Herbert, as next of kin. It merely states ‘Buxton, Spa’. 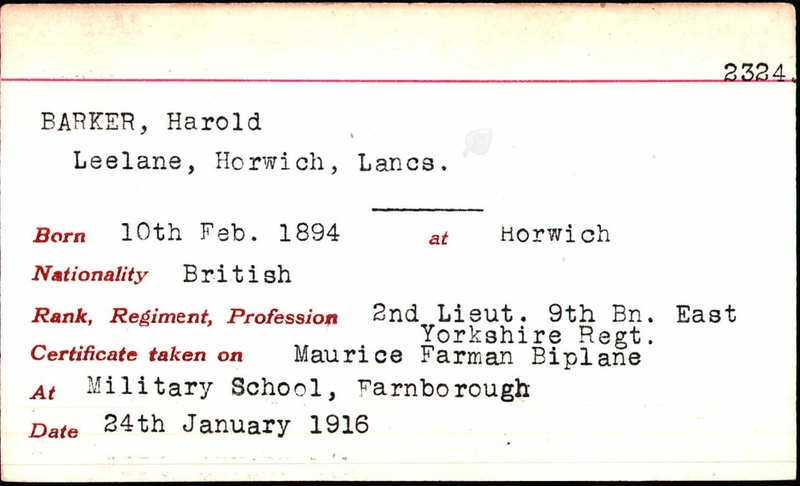 Towards the end of the war in early November 1918 Harold had submitted a request to be awarded a British Expeditionary Force 1914 service award on the basis that he had served on the western front in the French Foreign Legion. His service in this country and in France is duly recorded. However he was deemed ‘ineligible’ for the service award. Presumably because he was not a member of the British Army at the time for which he was claiming active front line service. This is an interesting initiative on his part. Why would someone be interested at that point in the war to establish a claim for a decoration? His records also reveal a surprising coda to his post war life. ‘Permission to retain rank withdrawn on conviction by the Civil Power’. A further entry records ‘At Sussex Quarter sessions on the 2/7/37 in the name of WILLIAM ALLAN BARKER sentenced to 12 and 6 months consecutively for false pretences. In 1937 Harold Barker’s fall from grace made the national press. Two further newspaper articles provide insight into the sort of life he was leading between the wars. The bravura displayed in his war time exploits is still there. Sadly his life has become underpinned by falsehood and deception. 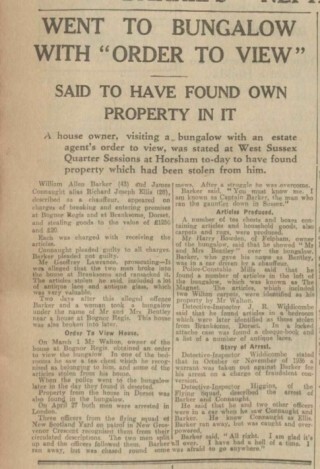 Harold Barker under the name of William Allen Barker is accused along with Richard Joseph Ellis, described as his Chauffeur, of ‘breaking and entering at Bognor Regis and Branskome, Dorset, and stealing goods to the value of ‘£1250 and £20’ (over £70,000 in today’s money) in early March 1937. Barker’s activities in Sussex did not end there. 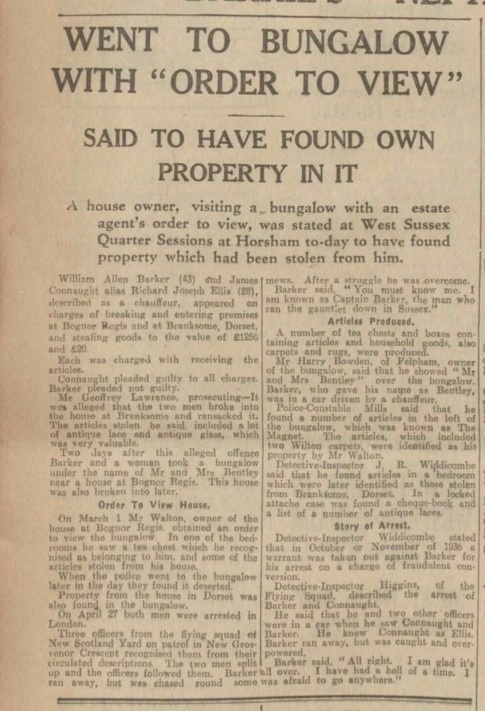 With a female companion under the name of Mr. and Mrs. Bentley, he rented a house Bognor Regis that was later found to contain stolen property from a nearby house in addition to articles from the Dorset property. Harold Barker must have been recognized. Two months later he and his ‘chauffeur’ were arrested by the Flying Squad after a chase in the West End of London. The court also learned that a warrant had also been issued for the arrest of Barker in late 1936 in connection with ‘fraudulent conversion’. This had involved receiving £650 by false pretences from a Kingston licensee by representing that he the holder of 2000 shares of a non-existent gold field company. The ‘chauffeur’ pleaded guilty. Barker pleaded not guilty to all charges and had the benefit of a lawyer to argue his case. The responses to both his arrest and the charges in court make interesting reading. On his arrest at the end of April 1937 the impression is given of a man at his wits end. He was reported as saying – “All right. I am glad it’s over. I have had a hell of a time. I was afraid to go anywhere.’ However by early July in his court appearance, his lawyer challenged the jury to consider just whose accounts they should believe. “It is this man’s word against the word of the Flying Squad.” Further more he questions the Flying Squad’s capacity to note down the verbatim details of Barker’s conversations – “If the Flying Squad think that a Sussex jury will believe that all these police-officers can get down in their notebooks, word for word, these different conversations. I am sorry for them.” The court also learned of Barker’s military career and his service with an award for gallantry in the French Foreign Legion. Standing before the court was a man of standing, a familiar figure in the West End, who at one time had owned racing ponies. He was found not guilty of breaking and entering: the crime for which his so-called accomplice had already pleaded guilty. However, the ‘ex-public schoolboy and once wealth man-about-town’ was found guilty of receiving stolen goods and fraudulent false pretences. You can imagine the narrative played out in court trading on his former status as an officer and a gentlemen, fallen on hard times, but no common burglar. It is also not hard to imagine what impact the ignominy of losing the right to use his rank might have had on Harold Barker. Barker’s post war exploits raise many questions about the whole progress of his life from Paris in 1914 to prison in 1937. Might his entry into the French Foreign Legion been a matter of expediency? Just what, for example, were his Parisian business interests? How and under what circumstances was he able to terminate his service the Legion? Did he desert? It has not been possible to trace any record of the French gallantry awards declared in court. What might have been his motives for seeking secondment to the RFC? Was he seduced by privileged status the life as a pilot afforded? Was deception the sole means of supporting his man about town London lifestyle? Finally, what happened to him on release from prison? Did the Second World War afford him further opportunities to use his undoubted skills? 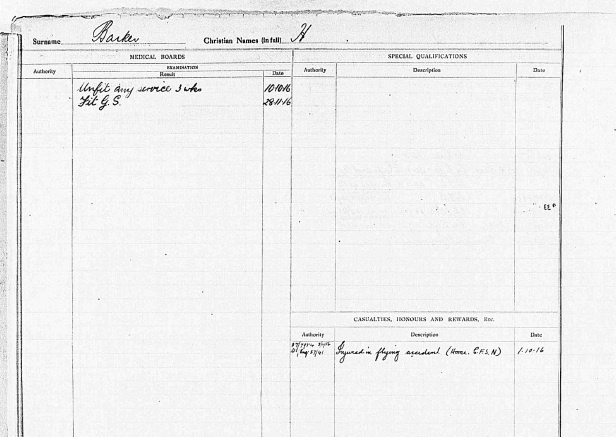 We do not know where Harold Barker lived on release from prison, what his occupation became, nor when he died. Perhaps he returned to France, maybe even to the Legion? Maybe his apparent lack of scruples equipped him to thrive in the turmoil of WW2. He was certainly the stuff of daring do. Whatever the reality of his life, who are we to judge? This page was added on 13/12/2012.